I decided that I should probably post something healthy here, especially since I have been nibbling as I have been cooking, and do NOT want to turn into a huge porker as this blog progresses. I am sure all of you have seen napa cabbage in supermarkets- it is the light colored cabbage (on the right, and on the left is bok choy). It is called 白菜, or <hakusai>. 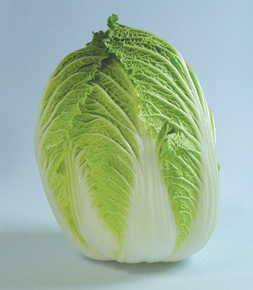 Napa cabbage is really really common to use this vegetable in yakisoba, nabe, or gyoza. I decided that its light and refreshing taste would be good in a salad. It happens to be just about the cheapest vegetable in Japan too! Either this salad is so delicious or the napa cabbage I bought was too big so I felt obligated to eat it, but I have been trying different variations of this for the past two weeks. Below is the best combo that I have figured out so far! 1. Toast walnuts at 180°C for 3-5 minutes, chop and place in bowl with napa cabbage. 2. Stick apples into a salt bath for 5-10 minutes (enough water to cover apples and 1 t salt) so that your apples do not turn oxidize too quickly and make your salad look unappetizing. Add on top of salad with cheese if you have opted for it. 3. To make the dressing, mix the apple vinegar and lemon juice, and then add salt and pepper. 4. Whisk in olive oil and then add in mayo and cream. Pour onto salad. Eat. Enjoy. Mmmmm….. 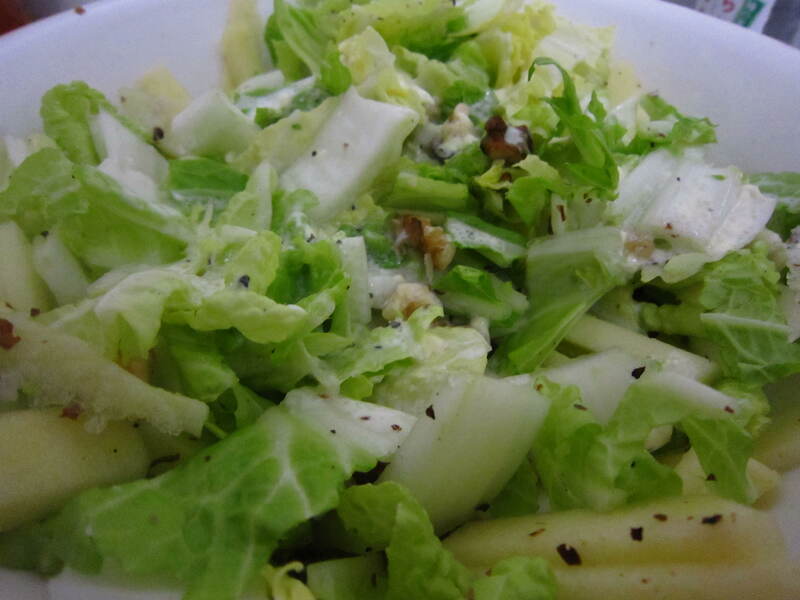 This entry was posted in Healthy, Salads, Super Easy, Vegetarian and tagged apples, napa cabbage, walnuts by Kim. Bookmark the permalink. Thanks so much Etsuko! Hopefully I will be blogging again soon.